Sunchang County, North Jeolla Province, will grant 5 million won ($4,400) to newlyweds and 2 million won to college freshman residing in the region, the county office announced Tuesday. The welfare policy is part of the county’s efforts to promote marriage and childbirth in Sunchang. 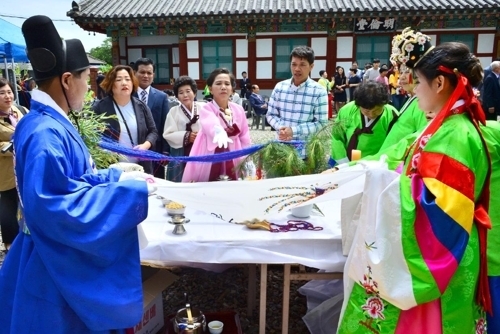 The marriage grant will be provided to a newlywed couple if the groom or bride has lived in Sunchang for more than one year before the marriage registration. The person must be under 39 years old, and it must be his or her first marriage. The county will provide the first 1 million won immediately after the marriage registration. An additional 2 million won will be given after one year and the final 2 million won two years after that. College freshmen who had graduated from a high school in Sunchang can receive 2 million won from the county, irrespective of the location of their college.